According to the Telegraph, Nick Kapur first pointed out the story on Twitter, linking to Associated Press coverage of the controversy. The shirts were the creation of 70-year-old Florida psychologist Ann Ruben and featured the character of Margaret triumphantly making the prediction. She got them into her local Wal-Mart, where they were doing a brisk if small-scale business—until they were pulled. At which point she went to the press. Higginbotham did not immediately return messages. [A spokesperson] wouldn’t discuss what the buyer told Ruben. 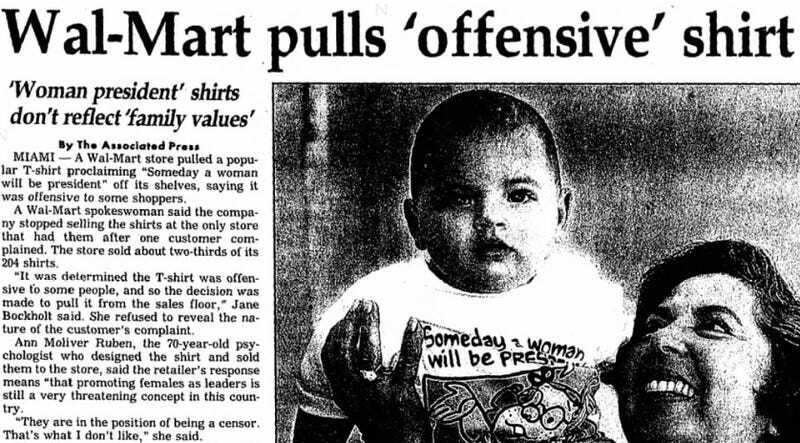 In a classic instance of the Streisand effect—and perhaps an early forerunner of celebs getting a little social media boost by “hitting back at the body/mommy/breastfeeding/woman shamers”—the fracas did wonders for the shirt’s availability. According to People, Wal-Mart was flooded with complaints and eventually ordered 30,000 for sale nationwide. Look for them in a Goodwill near you.